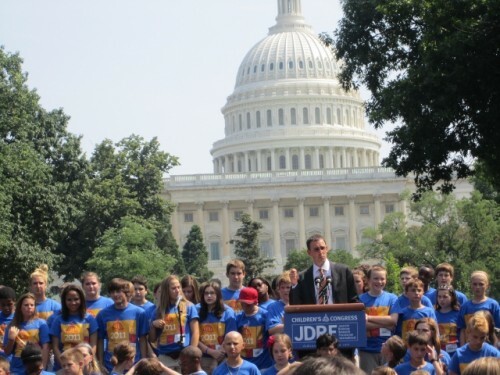 The JDRF Children’s Congress meets every other year in Washington, D.C. and took place this year June 20-22, 2011. The Juvenile Diabetes Research Foundation delegates included 150 children, ages 4 to 17, from every state, and several international delegates, who traveled to Washington to advocate for a cure for Type 1 diabetes. In addition to meeting with their senators and congressmen and women to advocate for the development of an artificial pancreas and for more funding for diabetes research, the children met with professionals with Type I who were there to inspire the kids but who got inspired by the children as well. In their home states, these children share with others what it’s like to have Type 1 diabetes, raise money to find a cure by participating in JDRF walks and in some cases by their own charitable businesses, meet with their congressional leaders locally to advocate for more support, and in many cases participate in research themselves. Jeffrey Bower, President and CEO of JDRF, whose son has Type 1, is leading the way to find a cure for Type 1 diabetes and to the development an artificial pancreas along the way. Supreme Court Justice Sonia Sotomayor told the children what it was like when she was diagnosed with Type 1 diabetes as a little girl. When it was time to have her blood drawn, she ran out of the hospital and hid under a car. Every child in the room could relate to the feeling of wanting to run away from diabetes. The parents gasped when she said she had to check her blood sugar with a razor when she was little. Before school, she said she pulled up a step stool to reach the stove so she could boil her syringe and needle to sterilize it before giving herself her shot of insulin. You can read more of what she had to say here at USA Today or at the Huffington Post: Justice Sotomayor: Childhood Diabetes ‘Taught Me Discipline’. Gary Hall, Jr. had won 4 Olympic medals in swimming when he got Type 1 diabetes and was told he would never compete again. He said that year he participated in the first JDRF Children’s Congress and was inspired by the children he met there. With a team of medical professionals, he strategized on how to avoid low blood sugars during 8 hours of aerobic exercise per day. He said he checked his blood sugar every 45 minutes during training. After his diagnosis, he went on to win 6 more Olympic medals including his 4 gold medals. Nat Strand, MD, won the Amazing Race in 2010. She gave up a hair brush so she could fit all her diabetes supplies that she would need in one allotted backpack for her journey around the world. She said she practices what she calls continuous improvement by applying what she learns each day in her diabetes management to the next. Carling Coffing, an LPGA professional golfer and winner of the Golf Channel’s reality show contest Big Break Sandals Resorts, said her diabetes was a family affair when she grew up. Whoever guessed her blood sugars the closest during the day got to pick what they would watch on TV that night. Kendall Simmons, NFL football player and super bowl champion, attributed his success in managing his diabetes to the buddy system. He said having a friend on his team who reminded him to test his blood sugar when he might be low helped him on the field. Aaron Kowalksi, Ph.D., marathon runner and leader of JDRF’s Artificial Pancreas Project to develop a closed-loop automated insulin-delivery system, is looking forward to the day when he and his brother and all others with diabetes will have a cure and be able to just “walk away” from diabetes. Kevin Kline, Oscar-award winning actor, explained the sleep deprivation from checking blood sugars during the night that parents with children with diabetes experience and the added worry parents have, such as when their children leave for college, with all knowing accuracy due to his having a son with Type 1 diabetes. He testified at the senate hearing led by Senators Susan Collins and Joe Lieberman on the importance of expediting the artificial pancreas due to the need for it now. Others who testified included Dr. Griffin Rodgers from the National Institutes of Health, Dr. Charles Zimliki from the Food and Drug Administration and several JDRF children’s congress delegates who spoke eloquently and persuasively on the need for a cure. It was the JRDF in action. 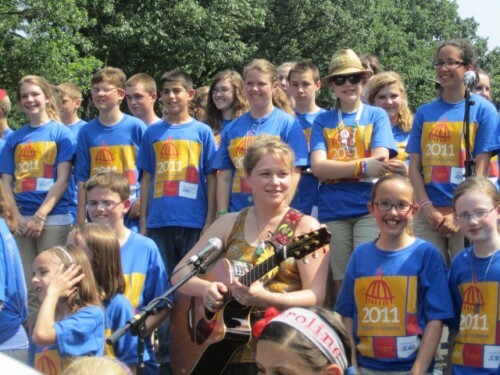 The children sang the song “Promise To Remember Me” with American Idol finalist Crystal Bowersox who later called the children “150 of the bravest kids I’ve ever met”. While the 2011 JDRF Children’s Congress is now over, these children and all other children and adults with Type 1 diabetes are still checking their blood sugars with pinpricks, counting carbohydrates, taking insulin, feeling shaky, dizzy and tearful from low blood sugars, or feeling sick with headaches, stomachaches, and thirst from high blood sugars, and taking shots or having needle infusion set changes for insulin pumps, getting their blood drawn for lab tests, working hard to stay healthy and avoid the complications of diabetes while fighting the exhaustion from a disease that never takes a break, and hoping for a cure every day and night. The JDRF Promise To Remember Me Campaign continues with meetings in hometowns with local representatives. To learn more or to participate, click here. To learn more about JDRF advocacy, click here and to become a JDRF advocate, sign up here. To support your local JDRF and participate in the Walk to A Cure, find your local walk here. To support the JDRF Ride To Cure Diabetes, click here. To learn more about the JDRF Children’s Congress, see the JDRF advocacy blog on the Juvenation website which includes videos from the event.